Pumpkin Pie is a favorite during Thanksgiving. Julie Shares her amazing Pumpkin Pie Recipe with The Women’s Inner Circle. We just love the way her personality shines through her recipe! “I’m just a hobbyist cook. But I do know there’s one thing I do better than some professional chefs, and that’s pumpkin pie. How do I know this? Because a few years ago, a local reporter interviewed chefs for an article on pumpkin pie. All the chefs used canned pumpkin. All of them. Now I ask you, have you ever had anything that tasted better canned than fresh? Really? I don’t know about you, but I rarely make more than a couple of pumpkin pies a year, so I want them to be awesome. It’s only a little extra work to use Fresh Pumpkin, and oh what a difference it makes! Cooked pumpkin freezes really well, so you can make it weeks in advance of Thanksgiving. Then when you actually go to make your pie, it really isn’t any more work than using canned! Take your pumpkin out of the freezer the night before, & let it thaw in the fridge. If it doesn’t thaw completely, you can let it sit on the counter for a bit right before assembling the pie. It’s also helpful the night before to give your condensed milk a good shake, because it does sometimes settle if it’s been on the shelf a while. Shaking the night before lets any froth settle before you use it in the pie. Fresh is best for nutmeg, too – freshly ground, that is. If you don’t have a nutmeg grinder, you can use a very fine grater such as a Microplane. In a pinch, you can substitute ground nutmeg from a jar. Just use half the amount, though, as it tends to be more intense. I like to use a combination of two types of cinnamon in my pumpkin pie. (My spice cabinet is ridiculously overfull.) Feel free to just use one teaspoon of whatever cinnamon you have. It’s a good idea to crack your eggs into a small bowl before adding them to the pumpkin. I learned the hard way how difficult it is to fish a small bit of shell out of a bowl of pumpkin! Use a low speed on your mixer (it’s #2 on my Kitchen Aid) for all steps. If you use a high speed, you end up with froth. It does no harm, your pie just won’t be as pretty. 1.) Preheat oven to 425°. Prepare a Single Pie Crust & place it in the pie plate, then put it in the freezer while you prepare the filling. 2.) Combine salt through cloves in a small prep bowl, and set aside. That’s the nutmeg in the center. Looks better than the jarred kind, doesn’t it? The two cinnamons are easy to tell apart, too. 3.) Blend pumpkin & eggs on low speed until well combined. 4.) Add both sugars; blend again on low. 5.) Now add the spices; blend on low. Add the milk & blend on low until everything is well blended, scraping the sides & bottom a couple of times. 6.) Take your pie plate with its crust out of the freezer. Carefully pour the mixture into the frozen crust. It will be very full. Place a crust shield on the pie (you can use strips of aluminum foil if you don’t have a crust shield), and very carefully move the pie into the oven. This is the hardest part of the whole process, since the filling is liquid & the dish is very full. 8.) 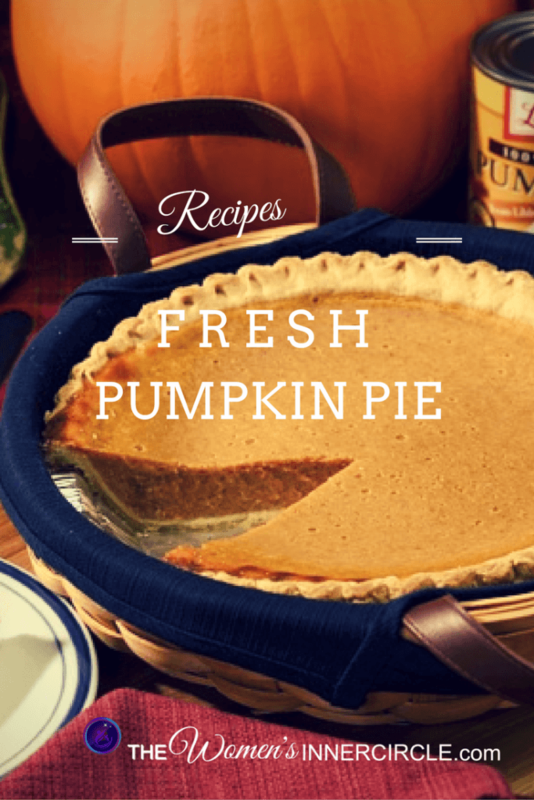 Allow the pie to cool completely to room temperature before serving. Serve with Fresh Whipped Cream. You’ll want this delicious recipe to serve even with your Leftovers. Here’s some ideas that will have you salivating. Looking Forward to making this delicious Pie. Thanks so much to Julie for sharing with us!